Jeanette & Nelson tribute show in Dublin, Ireland! 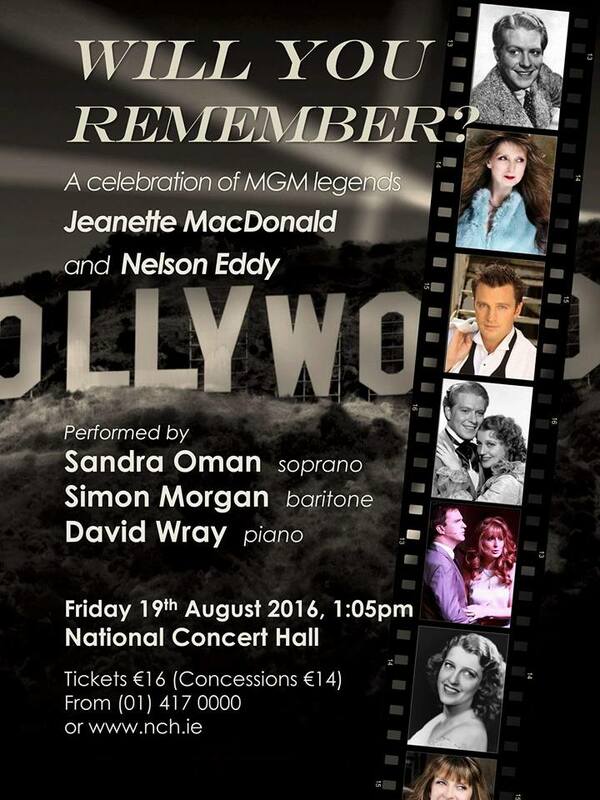 Calling all Jeanette MacDonald and Nelson Eddy fans in Dublin! Sheldon Nulty Music presents soprano Sandra Oman and baritone Simon Morgan in an unforgettable tribute to Silver Screen Icons of the ’30s and 40s, Jeannette MacDonald andNelson Eddy, in song and projected images. All of their famous cinematic hits – Will You Remember? ; Rose Marie; Ah! Sweet Mystery of Life; Lover Come Back to Me; Wanting You; – will be interspersed with stories of their public persona and private lives. A concert for all lovers of opera and the Silver Screen! For ticket information contact Sandra here or on her Facebook page.